A humble leader says to God, "I'm yours, no matter where you call me to go, what you call me to do, or how you call me to be. I will seek your will and way as I lead others to do the same." With this straightforward vision, Graham Standish invites leaders of faith to consider an approach to leadership he admits is at odds with popular images of leaders.The path Standish proposes is not easy. It is one taken by Mahatma Gandhi, who in turn was inspired by the example of Jesus as servant-leader. Leadership rooted in humility is at odds with an American culture that associates humility with weakness, spinelessness, and even cowardice. 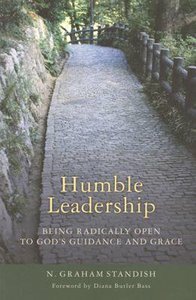 Humble leadership exposes our weakness, powerlessness, fear, and anxiety. Our cultural need for strength can infect Christian leaders with a pride that blinds them to their own limitations.Standish makes the case that humble leadership, grounded in the teachings of Jesus, means recognizing that what we have and who we are is a gift from God for which we must be grateful. It also means being radically and creatively open to God's guidance, grace, and presence in all things. This state of being is like the jazz musician's trust in improvisation. When we lead out of such openness, God's power and grace flow through us.Standish offers advice on how to gain greater humility and sustain it in the face the pressures all leaders face. He discusses self aware leadership, wherein you understand your personality type; the need for prayerful discernment; overcoming divisiveness to be a unifying force; being spirit-led; and being effective through the practice of humility in all things. - Publisher There comes a point at which leadership can break down precisely because of our success as leaders. When confidence turns to pride and arrogance, we lose sight of the people that we have been called to serve and become consumed with following our own vision. Graham Standish offers a way forward that moves us through this paradox by seeking to humbly follow God's plans rather than our own. Humble leadership, grounded in the teachings of Jesus, means recognizing that what we have and who we are is a gift from God, and our lives should reflect our gratitude for this gift. It requires us to be radically and creatively open to God's guidance, grace, and presence in everything. When we lead out of such openness, God's power and grace flow through us. There comes a point at which leadership can break down precisely because of our success as leaders. When confidence turns to pride and arrogance, we lose sight of the people that we have been called to serve and become consumed with following our own vision. Graham Standish offers a way forward that moves us through this paradox by seeking to humbly follow God's plans rather than our own. Humble leadership, grounded in the teachings of Jesus, means recognizing that what we have and who we are is a gift from God, and our lives should reflect our gratitude for this gift. It requires us to be radically and creatively open to God's guidance, grace, and presence in everything. When we lead out of such openness, God's power and grace flow through us. N. Graham Standish is Pastor of Calvin Presbyterian Church in Zelienople, Pennsylvania.